I realize we are coming out of 'motorcycle' season here in the northern parts of the US but the reminder is still relevant. Ladies and Gentleman ... put on those helmets; take your training courses; and don't forget your other protective gear. My hubby's Uncle Stan is a prime reminder of how important it is to wear that gear. Stan was 40, had a girlfriend, and was enjoying life! He was a carpenter; enjoyed hanging out with his buds; and his prized posession was his Harley. Nothing bad was going to happen to him, he was invincible. 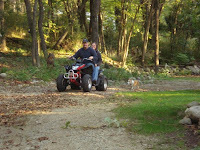 He didn't need a helmet (not legally required in Ohio). He liked the wind in his hair (or what he had at 40 years old). He was coming home later one night with the girlfriend on the back of the bike. He rolled through the stop-sign. He didn't see the pick-up truck that also didn't stop. His life changed forever in that moment. It has been almost two years and Stan is confined to a wheelchair, a feeding tube and is back in the care of his 80 year-old mother. His sisters take turns helping him shower, take him to "swim-lessons", and occasionally changing his bed-sheets. If you are 18 or 80 (or anywhere in between) you are NOT invincible. Your loved ones love you; they don't want to bury you or have to change your adult-sized diaper. "We should all be aware of motorcycles!" Yesterday while my oldest two were at school and my youngest was at the babysitter I made our way to our local YMCA. I was very excited to read that many YMCAs were giving free memberships to deployed families (about a $700 yearly-value for my family of five). Two weeks ago I contacted the Y here in Ohio to be sure they were participating and 'JACKPOT!' they were. I told them I would be in ASAP to fill out the paperwork and wouldn't you know life happened! (Sinus infections, impetigo, and a knee that needs physical therapy ... all in two weeks for my boys.) My ASAP took a little longer than expected and Shawn, the director of membership, called me twice to make sure everything was ok. How nice of him to take the time to call. I really felt cared about! If you have a local Y find out if they are participating: "Family-Support Program Expands; DoD, YMCA Strengthen Partnership". Of course we are missing Hubby more than anyone can imagine, but it is wonderful to be able to use the benefits we are given while he is gone serving our country! The Internet articles are praising the value of fish: brain food, heart healthy mainstay and a great Omega 3 source. I love it that fish is good for you, as I love fish. Have always loved it, and have a storehouse of recipes to flip through each month while I make up the monthly chart of 'marvelous meals'. I started this monthly chart when the kids were little and they started arguing over who was going to pick what we had for dinner. Cut out that opportunity for a brawl as soon as I could! Their dinner inputs were always welcome and sought after as I wrote up the menu calendar. Fish was usually requested - there was an abundance of this resource in Panama, Florida, South Carolina and Iceland. I grew up a beef-eater and now lean to the seafood suppers. For 4 people, 1 pound of fresh fish fillet. This weekend we used tilapia. In a small bowl combine all ingredients except fish! Set cheese mixture aside. Preheat broiler. *** Place fillets on a well-buttered or olive oiled rack (or Foil) and brush with a bit of oil. For cooking time, estimate 10 minutes total per inch of maximum thickness. It is best to under cook a bit if the fillets are thin at one end and thicker at the other. (They can always be put back in!) Broil the fish 2 to 4 inches from the broiler unit. If using fillets that have the skin, place on broiler pan skin side up. Put 'skin on' fillet under broiler for 3 min. Remove. Skin should peel off. Remove all skin. If using fillets such as tilapia, with no skin, oil the broiler pan AND the top of the fillets before putting them under the broiler. Broil until fish looses it's shiny appearance about 4 minutes. Remove from broiler, flip fillet over and spread on the cheese topping. replace in broiler 4 minutes more or until fish flakes when separated with a fork. Amberjack is our all time favorite for this recipe, followed by red snapper and ysa (Icelandic cod). Experiment. You will enjoy the tang of the topping. The holiday season is upon us. Halloween can be a very scary time for our young ones but this was a nice change of pace. 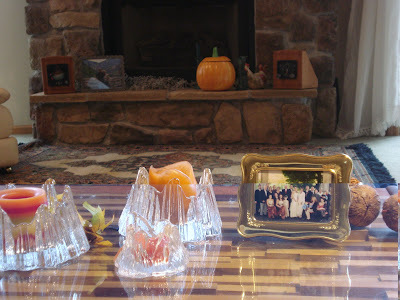 If you are looking for autumn ideas keep this one in mind. It comes highly recommended (from myself and kids alike)! First, a big thank you this morning to USAA and JJ Montanaro and Mike Kelly! They took the time to meet with MilitaryAvenue and help provide you with some very helpful information on the current financial crisis. Today we will talk about credit cards, credit availability and car loans. One of the issues with the financial crisis is the lack of ability to borrow money. If the larger banks have trouble borrowing, they can not loan money to consumers. Of course the biggest issue has been home mortgages, equity loans and foreclosures. This will now spread to other financial issues such as car loans. I read an article that said that consumers can expect to make larger down payments on car loans to qualify. JJ when asked, explained that the credit arena is getting tighter and could get real tight. We can expect to see it more difficult to get car loans and qualify for credit cards (hopefully that reduces the amount of junk mail I get with credit card offers inside). Increases in credit card interest rates could be around the corner. They did not expect the crisis to affect auto insurance rates as they are set by other standards. In response to the crisis, we should focus on fundamentals! We should make smart choices on consumer purchases, reduce credit card spending if we can not pay it off monthly and avoid the debt crisis that many Americans are feeling. Remember JJ's guidance to consumers in the first blog, "Spend less than they earn and save some to boot." Plan a budget and stick to it. If possible, do not carry a credit card balance. One way we helped reduce some food costs was to plant a garden and then we canned vegetables the last couple of years. Makes us look real smart when we go the commissary or grocery store (did you notice that the price of food is going up too?). Even a couple of tomato plants in a pot could save you a few bucks at the store! How are you planning to spend that re-enlistment or aircrew bonus this year? How about the combat exclusion tax advantage? Dislocation allowance? Our car is going to last another year so we can have some savings in the bank for a purchase versus credit. Maybe that large TDY check could go into savings for a new motorcycle next year instead of this year's credit purchase? In the meantime your credit score goes up and you can possibly get a better interest rate. Pay off that credit card balance too! One last recommendation: If you are not a member of USAA, please consider joining the association. In August they expanded membership eligibility to an additional three million veterans and once a veteran becomes a member their adult family members are eligible as well! They have seen their membership grow by 305,000 individuals in 2008! Any questions please go to their website at USAA to learn more! This has been a great series despite the tough times and I hope it has been helpful! Please send us comments or feedback! This program is designed to address the emotional stress that children of military personnel suffer during a parent's absence from home. Operation KidComfort serves children of deployed Service members. ASYMCA volunteers collect photographs from military families to make "photo-transfer" quilts (for children 5 years old and under; pillows for those over 5) that bear the images of the deployed family member, alone or interacting with the family. Photographs of the deployed parent are scanned into a computer, printed, and then placed onto the fabric. The quilt or pillow is then given to the child to play with, sleep with or use to comfort them from the grief of missing their deployed parent. Due to the publicity of the program, requests for quilts are coming in from around the country, mainly from the Reserve/Guard community. As a result, the ASY National Headquarters has developed a "kit" that contains everything needed to produce a quilt/pillow. These quilt kits are then sent to volunteers to assemble. The volunteer then mails (mailing label and postage strip is included) the quilt/pillow to the child for whom it was made. This might be a great Christmas present if you have a deployed member. I plan on ordering three for our boys! I'll let you know when they come in. I wanted to continue to use the expertise of our friends at USAA to talk about the current financial crisis gripping the country. After focusing on mortgages and debt issues in the first blog, I would like to write briefly today about the market and your investments. If your investments are anything like mine I saved a bit each month for many years and then in a couple of months/weeks saw a lot of it disappear. 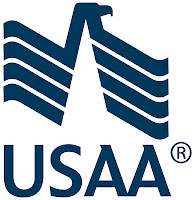 So I asked JJ Montanaro and Mike Kelly of USAA what we should be doing with these investments. JJ gave me a steady as she goes type of response. However, he said it is a good time to "rethink" your strategy but do not make wholesale changes. Talk to your financial planner and consider where you are at in the scheme of things. He suggested one opportunity might be to stay in the market but sell some investments. These could be taken as a tax loss, then reinvested into the market in another fund/stock/bond, etc. Always consult an expert before making changes and weighing tax issues. For more ways to deal with the Wall Street crisis he recommended USAA Tools and Tips for a Volatile Market. Invested and nearing retirement? Another great tool from USAA is a scheduled Webinar: Planning Your Retirement in Today's Economy on 29 October (next Wednesday) at 7-8 PM CST. Enjoy this webinar led by JJ from the comfort of your home. Never done a webinar? A webinar is a seminar based on the web. You get the advantages of attending a seminar without the travel or hassle factor of finding it! The experience comes to your living room or office on your laptop or PC! This is a great chance to hear from the experts and plan your future. The best part is that it is free! I have one more blog to do from my interview with USAA and it will be on the day to day issues of credit cards, car loans, etc and how the bank crisis is going to affect those and your wallets. PS: During my research for this interview with USAA I found some interesting information about USAA's CEO, General (retired) Joe Robles. Joe Robles began his adult life working in the steel mills of Lorain, Ohio before joining the Army. In an article in the New York Times he relates that he was drafted by the Army and basically never looked back. I can tell you as a steelworker's kid from the Gary, Indiana area that I made a similar decision after 5 summers in the mills during college. I had my grandfather, my dad. my brother and 12 uncles and 1 aunt in the mills with me and it was hot and dirty work! So Joe we appreciate your background and thank you for taking care of our funds in this crisis! The Kocsis Household is crazy-busy. Yours too? I know plenty of us are flying by the seat of our pants with barely time to stop and sip the coffee. Yet, when I settle into bed at night there are days when I can't even begin to recall what I had accomplished that day. Its a sinking feeling to go through the day and feel like you have done nothing, when you were running around raged doing everything. That is the beauty of 'checklists' for me. I have a weekly calendar that sits very comfortably in my purse. It goes with me everywhere. If I'm sitting at a stop light and suddenly remember something else I need to do - I whip out that calendar and add it to my weeks to do list. What a relief to write it down. Otherwise, I tell myself "Ok, I can't forget this ..." because inevitably I will. There is much excitement around the MilitaryAvenue office! We have just recently launched MilitaryAvenue Answers. ... the ideas are endless and the potential is amazing! We, the military members & families, are a wonderful, active, helpful community! Let's ask Questions and get some Answers! This has taken a long time but finally the federal government has given military spouses priority for a federal civilian work force job! President Bush signed an executive order this week that is going to help military spouses stay employed during their many relocations! Patricia Bradshaw, deputy undersecretary of defense for civilian personnel policy said that the order authorizes noncompetitive hiring of spouses and should make the hiring process easier and faster for those in this category. The rules will be out in January according to reports and military spouses should be standing at the front of the line to sign up for these jobs! I remember one overseas location where my spouse who was a qualified, certified, licensed teacher but not part of the federal work force and she was not hired full time. Instead the federal government moved another teacher who had been in their system for a while to the location with all of the associated costs for a PCS. It was a horrendous decision and one that cost the taxpayers money and added to the frustration of a military family who faced a harsh environment for almost 3 years. Spouses: we will try to keep you updated and you should go to the local civilian hire office on your installation and let them know you are interested. You must be qualified but when they have a position that is open that you can fill--it should be yours. The beauty is that when you are qualified and there is an opening you get priority! Then when you PCS, the next installation civilian personnel office has a federal employee with priority and your job search may have been made a lot easier! In fact, when the military member gets orders you can begin a transfer process for your job if the next installation has a similar job available. Let me know what happens and if you see any issues so we can keep the information flow moving so that you and other spouses get the job you so well deserve! We should push a similar program for military brats trying to get summer hire jobs while in college or preparing for college. But that ... is another story for a different blog! 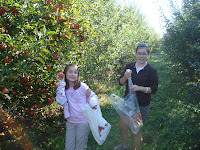 Weeks ago we went apple picking... we picked more apples than can fit in our refrigerators. I have canned them, baked them, cooked them and savored every bite. Folks walk into the house olfactory nerves a twitching! The aromas from apples are unbeatable. Here is another sure fire winner for a juicy, solid apple. It only takes one apple to make this confection. Heat oven to 400 degrees. Grease bottom of muffin cups. Beat egg; stir in milk and oil. Grate apple. Mix in remaining ingredients just until flour is moistened... do not over mix. Batter should be lumpy! Sprinkle nut topping over each top. Bake 25 minutes. Isn't it fun to celebrate the seasons with the food, smells and colors that we can add! We will be publishing our October Newsletter on Sunday, October 19th. The theme this month is "Finances". We have some great professional resources as well as some personal stories lined up for your enjoyment. The Holidays are right around the corner. Take the time to think about your family's financial-makeup before it becomes a major stressor! The October "Finances Newsletter" will have our regular features including our top 10 MilitaryAvenue.com articles from this past month. Create an account on MilitaryAvenue.com today where you can manage your newsletter subscription! We would love to be in touch. A cold snap came and turned our maples and oaks from green giants into jewel dressed wonders. Right now, a steady breeze is filtering those crimson and gold leaves and sending them spiraling sideways with many skidding onto our deck. It is a sight to behold. Landscaping has become a pure pleasure for Dale and I. He put up a split rail fence that has added a framework to this fall picture outside while I planted vinca under and in front which adds a dark green matting for our portrait. At the end of the day, muscles were talking and our sweet tooth chattered! A basket of apples announced it was time... time for a Pocketful of Apples. Time to sit and watch the evening news, grap the remote and a freshly baked reward. Combine brown sugar, butter and chopped walnuts with a fork until crumbly. In another bowl, place apples and stir flour and 1/4 t cinnamon on top. Roll pie crusts on a floured surface into a 16 x 8" rectangle. Cut into into 4 x 8" strips (four strips); then cut each strip in half making four squares. This will give you 8 pockets! Place about 1/4 cup of the apple mixture on right half of each square. Sprinkle with walnut mixture. Fold left side over right side of square - pockets will be full! Press edges with a fork to seal. Prick top with fork. Place on ungreased large cooke sheet with a rim - to catch any juices that might spill out. Bake 22 to 28 inutes or unti lgolden brown. Cool 10 minutes. Meanwhile, in small bowl, stir together glaze ingredients until smooth. Drizzle over pockets. Cool completely, about 30 minutes. The apple orchards call. They do. Apples to be picked, the long rows of Jonathons, honey crisps, Ida reds and so on just needed to be revisited... and we trooped home with a different variety in the newest bushel: 'Spies for Pies'. Crisp and juicy, these apples are terrific for snacking and for baking. 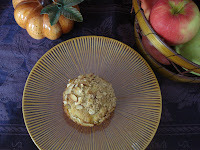 I love using them in the recipe that represents fall baking: Apple Crisp. The aromas of cinnamon and nutmeg do a frontal attack on the senses followed by the visual of hot bubbling brown sugar and apple juices. Yes, this is just one reason to celebrate the seasons! I love to have an equal amount of crisp as I do apples, so, use a large baking pan for this one! Heat oven to 375 degrees. Place 1/2 apples slices in a 9 x 13 pan. Mix remaining ingredients thoroughly. Crumble 1/2 of the oat mixture over apples, cover with remaining apples and top off with the rest of the oat mixture. Bake for 30 minutes or until apples are tender or the aroma is just too tempting to leave in there any longer! Serve warm. Happy Autumn to you! We like to bring important information to the military community and one of the most critical items I can think of in anticipation of Veterans Day on November 11th is your new educational benefits. Like a NASCAR racer you must keep your educational engine tuned for max performance! What an opportunity to grow your expertise and job skills while in the service or post service! Please take advantage of them as many before you have done. They are clearly better now and offer many variables and cover the cost of tuition, books and a monthly stipend is available too! We have a great article on the New GI Bill on MilitaryAvenue and you should read it to learn more about what your benefits are. Did you know there is a way for many veterans to transfer the benefit to a family member? What a great improvement for a military family with educational costs climbing faster than inflation. Your education is critical to your future and will be something that helps keep you tuned up for the challenges of the future. Today also starts the addition of Central Michigan University as a base sponsor on MilitaryAvenue and their educational programs fit well with the GI Bill and they can be found at numerous installations and online as well. They can answer questions about the GI Bill too. The education offices at your installation are another great resource for information as well! As you make that quick pit stop for your education benefits think how many laps you can cover to reach those goals and life experiences with a new degree. The checkered flag is just waiting for you to run past. Don't delay; get on the gas today! The frost is coming. The temperatures are creeping down each night, going a degree lower and getting within striking distance of the first freeze. The frost will soon be on the pumpkins. Yes Autumn is here. As the garden patch is reduced to empty rows... the bell pepper plants still are heavy with beautiful colors of a fall palate. Our tomatoes are long gone, but the local orchard is still selling them by the 1/2 bushel. So... the mix of the vitamin rich, dark gems of tomato and red/green pepper are just perfect for an evening meal. I made Stuffed Peppers last night, a great meal for watching the amount of food you intake, as the portion is made up, the option for seconds is not there. Some slices of sharp Cheddar Cheese add a tangy contrast to this meal. 3 sweet banana peppers, seeds removed and diced. Turn oven onto broil. Place peppers on a cookie sheet and broil until skin is browned and bubbled! Turn to brown other side. About 4 minutes per side. Place immediately in a paper bag, let sit on the counter 5 minutes to cool. Cut off top, discard seeds from peppers. Peel skins from peppers, set peppers aside. In a frying pan, cook ground beef, banana peppers, garlic, parsley and salt break into small pieces. Brown meat. In sauce pan, add margarine, salt and rice. Allow this to steam, when hot, add water and put on the cover. When liquid has cooked into rice, add to meat mixture. Add tomato sauce. Remove from heat. 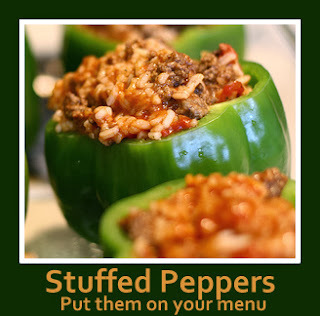 Fill red/green peppers with meat/rice mixture. Stand peppers up in a baking dish place top back on each cut off bell pepper. Bake at 350 for 15 minutes. Remove from heat and place a slice of sharp cheddar on each pepper as they are served. Serve some cheddar slices on the side for an accent.